My name is Boris Samoylenko, I am a software engineer, and eventually, the author of the SpotterLead.net. Besides software engineering, aviation (especially civil) may be rightfully considered to be my second greatest passion. Not so much time ago my aviation interest took another twist and I went in for plane spotting. But after a few initial visits to airports with a camera, it became clear that a proper preparation needed for such activities. Surely if you don’t want to be in a risk of being entirely disappointed by the result. Sometimes result was spoiled by unexpected weather change, sometimes by the rarity of landings and takeoffs (peak time was missed), sometimes by yet-another-random-thing which was not taken into account. Before visiting airport, I had to consult few sources: airport site for departures & arrivals online-board, weather services, Flightradar24. It was quite enough at glance, but if I had a purpose of taking a shot of some specific aircraft or, on the contrary, catch the greatest number of aircrafts during the shortest time, I immediately found traditional airport sites departures and arrivals completely inconvenient to be used for this purpose. I had to analyze them carefully, remove codeshare flights, perform multiple sorts and filterings (which quite often were not even supported by airport site) and still I had no whole picture. It could be particularly simple for airports with small amount of takeoffs and landings, but imagine doing such a work for, let’s say, Amsterdam Schiphol or Frakfurt Flughafen. The solution was quite straitforward: to create some kind of an aggregation service which will gather all the information required for planespotting and display it clearly in spotter-friendly shell. This information should include: arriving and departing flights for the airport, current weather and forecast, lighting condition for a specific time of day, estimation of runways in use. The key detail here is to clearly visualize this information in a way when it becomes obvious when, how much and which planes exactly will arrive/depart and which weather and lighting conditions will be at this specific time. What's more improtant is that plane spotter will get away with only one single service instead of scouring several sources with varying usability not even designated for plane spotters. 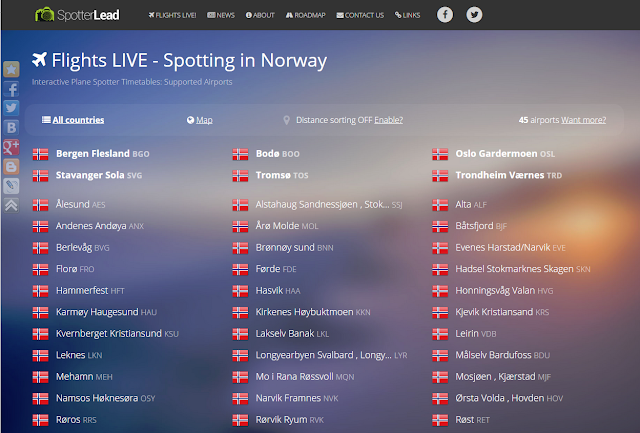 That's how SpotterLead - Live Planespotter Timetables was born. Initially, I created this project for satisfying my personal needs and for just one single airport. But later I decided to enhance it and give others an ability to use it. Flights Live is the main section of the service. 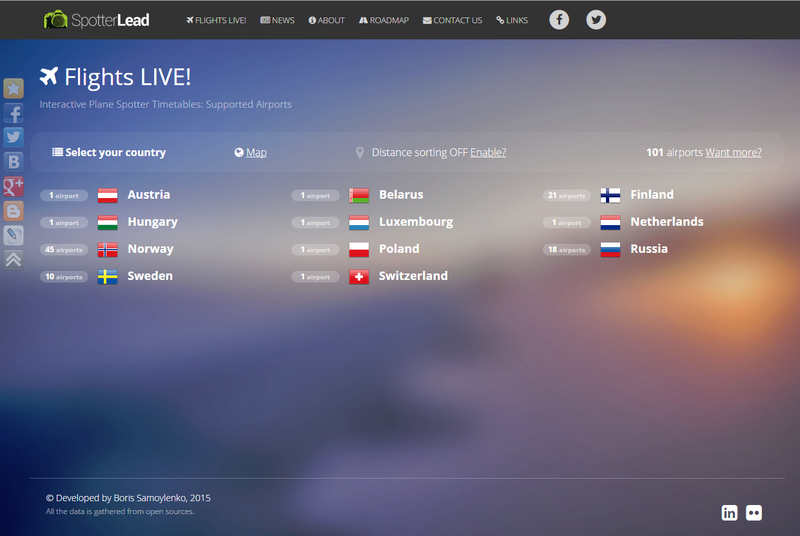 It provides a list of supported airports grouped by countries. It also supports geolocation, so you can see airports nearest to you. If you select an airport, timetables will be loaded. Usually it takes from 3 to 15 seconds depending on programm logic serving this or that arport (more about this below). Data is cached temporarily so the following consequent page loads will perform much faster as there will be no calls to remote sites when cached data is used. At the top of the page you can see the logo or the name of the airport, current airport local time, useful airport-related links and current weather. 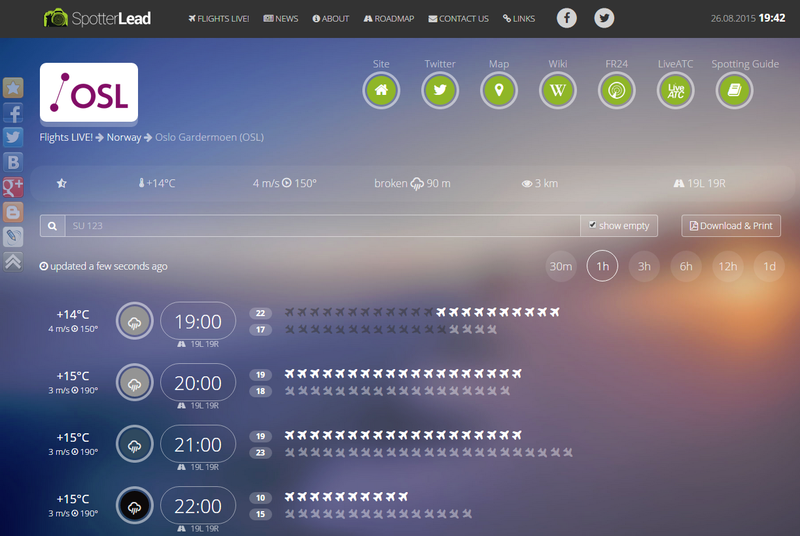 If you click weather, METAR will be displayed. Search bar allow you to look for a specific flight by different criteria. Search algorithm will break your request into words using spaces and find all flights within which all the words will be found (FlightNumber number, aircraft, airline, registration and time are considered). If you want to perform an exact phrase search without word separation, use quotes before and after your request. For negating the request, use exclamation sign before the word (example: !Lufthansa will find all flights containing no entires of "Lufthansa" in its data). After that you will notice timetable itself. 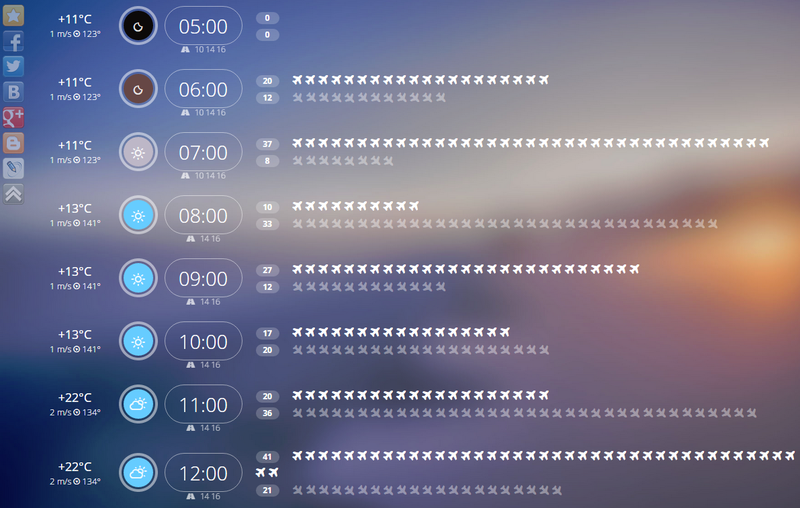 All the flights for upcoming 24 hours are grouped into one-hour periods (you may change the duration by pressing relevant round buttons at the top of timetable). Each period has an icon visualization of arrivals and departures so you have clear understanding of when there is more traffic and when is less. So, if you want to get more aircraft photos during the shortest time, choose a period with the greatest number of plane icons. Please notice that each period has a weather indication. Besides icons and text information there is also a color indication. Color approximately correlates with the real sky color at the beginning of the time period. So if there is a day time, you will see a lightblue icon, if there is night – a black one, in case of overcast you will notice grey icon. During sunrise or sunsets intermediate colors may be notcied. Color is based on sunrise/sunset times and weather data. Slightly below the time indication you may notice a list of runways that quite likely be active at this time. This estimation is based on wind forecast calculations. 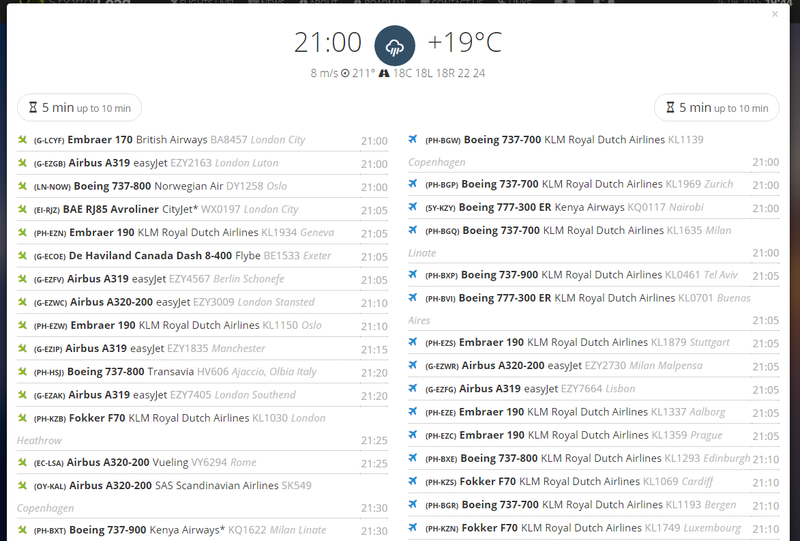 If you click the period you will see a modal window with the detailed information about every flight within selected period: arrivals on the left and departures on the right. Besides this and weather information you will also see approximation of waiting time between flights at the top of each column. For switching between periods when modal is open, round left/right buttons on its sides, or left/right keyboard keys may be used. The data on Flights Live pages is updated once in a minute. Download & Print button located near the search bar will generate a printable PDF version of timetables with flights for the upcoming 24 hours grouped by one-hour periods. If you're not able to access service when you're at the airport, this printed timetable may help you. 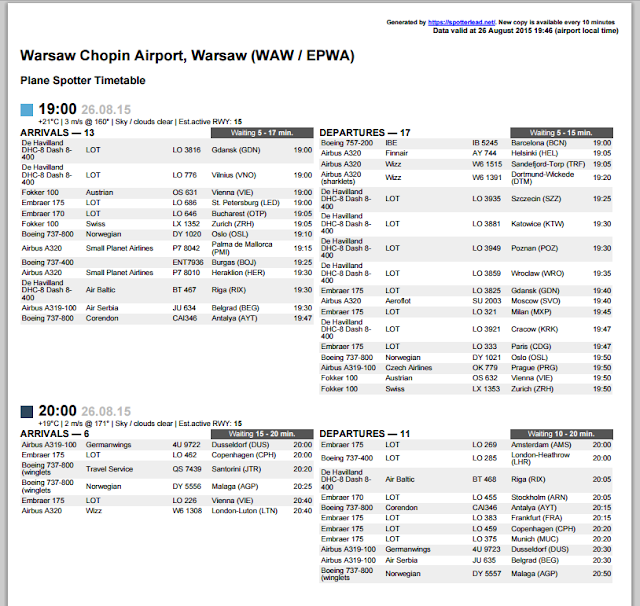 These timetables contain all the information available in web version. Mobile version is currently under reconstruction, so soon you will be able to take these timetables with you even without printing it. By the moment of writing this article there are 100+ airports supported. The best coverage is in Norway, Sweden, Finland and Russia at the moment. Frankfurt-am-Main, Hamburg, Amsterdam Schiphol, Vienna Schwechat, Budapest Ferenz Liszt, Warsaw Chopin, Zurich, Oslo Gardermoen, Helsinki Vantaa, Stockholm Arlanda, Manchester, London Gatwick, Moscow (all three airports), St.Petersburg Pulkovo, Minsk National. I'm working on enabling support for more and more airports, but if you want your airport to be prioritized in the support implemetation queue, please let me know. Despite the simplicity of service look its technical backend is quite complex, so I will give you just a few details about it. Service aggregates information from various sources and free API, but the main flight information is gathered from airport sites directly and from Yandex Timetables API (when airport site doesn't disclose aircraft type information, what happens quite often unfortunatelly, service requests Yandex Timetable API to get the expected aircraft type for the current day). Links to all the sources and API used by this or that Flights Live page are located at the bottom of this page. Algorithms serving each airport or airport group are very individual depending on which approach is required to get data from airport sites. Therefore the precision of data may vary dramatically from airport to airport. Also, the way airport site discloses flight information influences directly on how long it may last introducing Flights Live support for it. Sometimes it may take not more than half an hour, but sometimes long days of developing, testing and debugging are required to provide support. It's unlikely but still possible that some airports may not be supported at all. To provide some rough indication of data precision degree a star-indication is added to the left of the weather bar on the Flights Live page. If the star is fully white, it means that data is quite trustworthy and is quite often updated by the airport. If the star is half-white, it means that data source may provide insufficient or contradictive information which leads to noticeable predictions applied by SpotterLead. The empty star is unlikely, but in this case it means that it's not a good idea to use this timetable. Why not Use FlightStats, FlightAware or Flightradar24 and not Support All the Airport Worldwide at Once? FlightStats and FlightAware has excellent API and may provide the major part of the information required for the SpotterLead purposes. But these are too expensive for a non-commercial project like SpotterLead. If I use them, I will have to make my service commercial what I don't want to do. And Flightradar24 is well-known for not having any public API. Although SpotterLead is operating quite well, there's quite much room to grow: there are constant bugs and errors appearing (mostly due to large amount of individual algorithms used for different airports). All of this is maintained regularly. All in all I have already implemented functionality satisfying my own needs but I still have more ideas for further development. Implement them or not, or in which order to do this, depends on how successful will be the search of potential audience for the service. If the service will be found useful by plane spotters, the development process will go on. There are more ideas about creating mobile version (or maybe even mobile apps), timetables for more than 24 hours, more airports and so on. Your feedback is extremely welcome! You may request new features, airports and modifications for existing ones!